Semantic Publishing | Semantic publishing is the enhancement of scholarly publications by the use of modern web standards to improve interactivity, openness and usability, including the use of ontologies to encode rich semantics in the form of machine-readable RDF metadata. It is not the first time we introduce our work on mapping DataCite to RDF – as already discussed in a previous post on this blog. Some news on this front: recently, David Shotton, Jan Ashton, Amy Barton, Egbert Gramsbergen, and Marie-Christine Jacquemot, and I have started a joint collaboration for producing a new version of the DataCite ontology and for updating existing mapping document from DataCite XML terms into RDF according to the current available DataCite Specification, i.e., the DataCite Metadata Schema 3.1 released in 2014. Peroni, S. (2016): Example of use of DataCite #2. figshare. https://dx.doi.org/10.6084/m9.figshare.2075353. 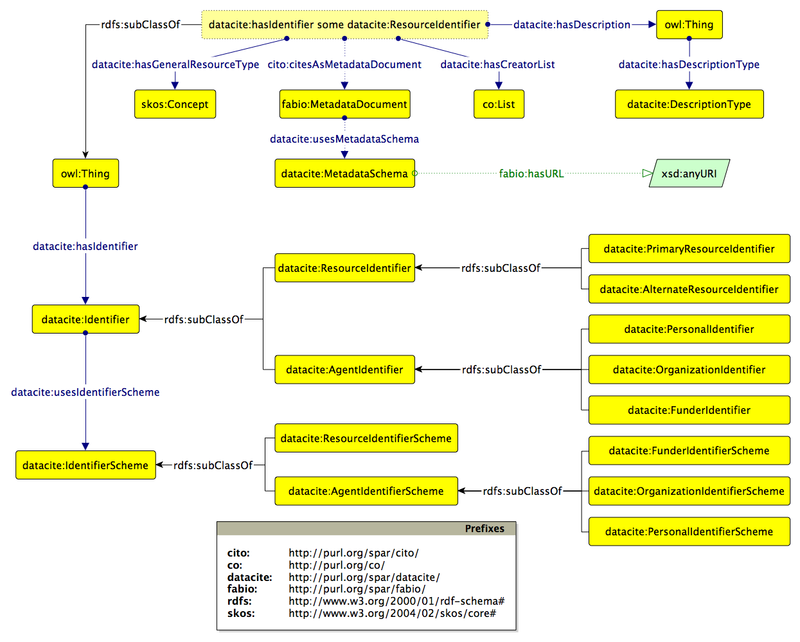 The Graffoo diagram introducing the main classes and properties of the DataCite Ontology. As in the past blog posts on this topic, we warmly commend the use of this mapping and the related SPAR Ontologies (among which the DataCite Ontology) to all who wish to encode DataCite metadata in RDF, and welcome feedback on this work. This comprehensive set of terms permits the various access statuses of documents to be encoded in RDF and published on the Semantic Web. For convenience of reference, the textual definitions that I have used for these terms (recorded as rdfs:comments in the PSO ontology), grouped in logical order, are given below. The status of a published work (typically a scholarly publication or a dataset) that is freely available via the Internet for third parties to read without payment of access or subscription fees, and (in the case of a work published under a full open-access license) that is freely available to download and reuse for any purposes including commercial ones, including modification of the original work, its integration with other material, and its re-publication, subject typically to a requirement that the original authors and the source of the original work are acknowledged in compliance with scholarly citation norms. The status of a published work which is free to read on-line, in contrast to subscription-access works, but to which licensing restrictions apply, limiting the possibilities for downloading, text mining, modification, re-publication or re-use of the published work. The term Gratis Open Access thus signifies removal of the price barrier to view. While both imply ‘free’ (a potentially ambiguous word), Gratis Open Access equates to ‘free as in beer’ while Libre Open Access (q.v.) equates to ‘free as in speech’. Gratis Open Access is thus a necessary but not a sufficient condition for true Libre Open Access. Many ‘open access’ publications by commercial scholarly publishers are only Gratis Open Access, while almost all publications by ‘pure’ Open Access publishers are Libre Open Access. The status of a published work which is both free to read on-line, and to which additional usage rights apply, for example the right to text mine, make derivative works, re-use and re-publish the published work, such rights frequently being defined by application of an explicit license such as a Creative Commons license. The status of a published work, typically a journal article, made available by the publisher on the publisher’s own web site for third parties to read without payment of access or subscription fees. Gold open access has the benefit that the article is findable where you expect it to be, but licensing restrictions may limit the possibilities for downloading, text mining, modification, re-publication or re-use of the published work. Gold open-access publication typically involves payment by the author or his/her institution to the publisher of an article processing charge (aka an author publishing charge). The status of a published work made available by the author, by self-archiving a version of the work for free and open public use in their institutional repository, in a central repository, or elsewhere, in parallel with publication of a subscription-access Version of Record of the work by a publisher. The green open-access version of the work may be a preprint (the version of the article as first submitted for publication) or a postprint (the pre-publication version of the article after incorporation of authors’ responses to peer reviewers’ comments). Its availability may have an embargo restriction imposed by the publisher of the subscription-access version of the work that prevents the green open-access version from being freely available until some substantial time after publication of the subscription-access journal issue containing that article. A green open access work should be accompanied by a license explicitly defining usage rights, for example a Creative Commons Attribution License. The status of a published work, typically an article in a journal issue, that is not available to read without payment of an article access fee or a journal subscription fee for that publication. The status of a published work that is subjected to a publication embargo, which means that the material cannot be published, or in the case of a press release that it cannot be reported on, until a particular date known as the embargo date. For open-access journal articles, an embargoed article is one in which availability of the open-access version of the article is delayed by the publisher for a substantial embargo period, typically of six or twelve months, after subscription-access availability of the published work. The status of a work (typically a scholarly paper or a dataset) to which access is restricted. For example, confidential information to which access is made available only to those who have been approved by the owner or copyright holder of the asset after personal application, or to those with appropriate security clearance, or to those within a partnership. The status of a work (typically a private or secret paper or a confidential dataset) that is typically held unpublished in a ‘dark’ archive whose existence is unknown by the wider world, and that is only available to the owner or copyright holder of the asset. The status of a document containing information that must be kept confidential. The status of a document containing information that may be shared publicly. The status of a work (for example a document or a dataset) that has not been published by the author, a publisher or a data repository. Of relevance to these statuses are two financial terms within FRAPO, the Funding, Research Administration and Projects Ontology, previously described in this blog post: frapo:ArticleProcessingCharge and frapo:Subscription. CiTO, the Citation Typing Ontology, contains 41 object properties that can be used to characterize the nature of a bibliographic citation linking the citing paper to the citing paper, plus an equal number of their inverse properties. Some of these are also appropriate for the characterization of data citations, as described here. These can be classified into factual properties (e.g. cito:usesDataFrom) and rhetorical properties, with the latter being sub-grouped into positive properties (e.g. cito:supports), neutral properties (e.g. cito:reviews) and negative ones (e.g. cito:critiques). These sub-groupings are described in a new extension ontology, the CiTO Functions Ontology available from http://www.essepuntato.it/2013/03/cito-functions. However, despite this extensive list of CiTO properties, there will be situations in which the purpose of making a citation cannot be adequately expressed using these CiTO properties. In such situations, it is now possible to use the new Open Annotation Data Model (http://www.openannotation.org/spec/core/) to define the reason for, or the nature of, the citation. using a CiTO citation characterization property such as cito:confirms. A property that relates a cito:Citation to the citing entity. A property that relates a cito:Citation to the cited entity. Adopting the same philosophy as used for the other CiTO object properties, we have avoided adding domain and range restrictions to these properties, enabling them to be used in circumstances that we do not foresee. Using such OWL2 punning (described at http://www.w3.org/TR/2009/WD-owl2-new-features-20090611/#F12:_Punning), the CiTO object property is considered as a proper named individual of the class owl:Thing. Such reification of citation acts can be very useful, since it permits one to combine these CiTO properties with other vocabularies, or to handle situations in which none of the citation characterizations available in CiTO are applicable. Such situations can be resolved by the creation of a user-defined citation characterization, for example by using the Open Annotation Data Model. Use of the Open Annotation Data Model is well described by Robert Sanderson in his SlideShare presentation at http://www.slideshare.net/azaroth42/oai8-openanno. In this model, an annotation is described as a member of the class oa:Annotation, which has a body containing the annotation itself defined by oa:hasBody, and an annotation target (the thing to which the annotation relates) defined by oa:hasTarget, as shown in the following figure. Legend: The Open Annotation Basic Data Model (from Robert Sanderson’s SlideShare presentation at http://www.slideshare.net/azaroth42/oai8-openanno). In our case, the target of the annotation is a member of the class cito:Citation, while the body, i.e. the textual content of the annotation itself, is described using the W3C Content Vocabulary (http://www.w3.org/TR/Content-in-RDF10/) as a member of the class cnt:ContentAsText, which the property cnt:chars relates to the text string actually providing the annotation. As shown in the figure, an OA annotation can be further characterized by the motivation for making the annotation, defined by oa:isMotivatedBy. In our case, the appropriate motivation is oa:commenting, an instance of the class oa:Motivation. Simple and flexible! We commend use of the Open Annotation Data Model to make such “free-hand” citation characterizations.